It's hard to believe that a month has passed since my last entry. It feels like only a week or two. I'll try to get caught up to date on everything I've been working on, but it may take a few entries to get it all in. First, an update on my Amazin' Mets Pocket Purse -- I have used it now for 3 games at Shea and it has been very useful. Our first trip to Shea Stadium by train (April 22 Mets/Braves) was a good experience. My pocket purse held all my essential items, including my tickets, and the only additional items I needed to carry were my seat cushions. We arrived at the stadium just as they were finishing the National Anthem, so it was nice to breeze through the security lines without having to open a bag for inspection. If our team had won that game, the day would have been complete. We didn't take the train to the next 2 games (May 13 vs. Brewers and May 20 vs. Yankees), but I still used my pocket purse. Our seats are on the end of the aisle, and every time someone from inside the section needed to get by, we were standing up to let them pass, so it was convenient not to worry about dropping my purse. One thing I would like to change about my pocket purse is to make the shoulder strap adjustable and detachable. There are times when it feels a little long; also since I usually dress in many layers to keep warm, it would have been useful to be able to detach the shoulder strap when my purse ended up between layers of jackets. I have an idea on the type of buckle I'd like to use to modify the shoulder strap for this particular pocket purse, and if time permits, I'll get it done in time for our next trip to Shea on June 3 vs. Arizona. While we were at the game on May 13, we noticed a promotion announced on the big scoreboard -- "Met Your Pet". 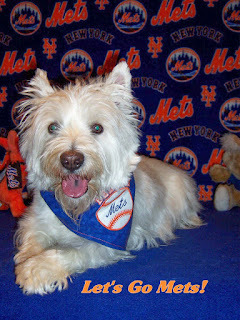 They asked fans to email photos of their pets in Mets gear for a chance to win tickets to a game. So of course, I had to come up with a great photo of Keli to submit. Last week, I purchased 2 yards of very hard to find Mets fleece on eBay, so I used that as the background for my photo, and some dark blue fleece covered the table where Keli would pose for this photograph. Next, I needed some props. At a clearance sale in March, I had bought a baseball shaped basket, which I filled with peanuts. One of Keli's newer squeaky toys is an orange bunny -- I tied a scrap piece of the Mets MLB licensed cotton fabric around it's neck. I happened to find another squeaky toy which was a dog with a blue baseball cap and a ball wedged between its paws. Last, I remembered I had a stuffed koala bear from around 1986, dressed in a Mets cap and shirt. Everything was ready -- now I had to dress Keli. She's not the kind of dog who will wear caps or hats, and a collar just wouldn't show up on her. Most dog sweaters or t-shirts don't fit her because she is big for a westie. So I decided to use some of the precious Mets MLB licensed fabric to make a customized bandanna for her to wear around her neck. I fussy-cut the Mets fabric so that the 'Mets' and 'NY' logos were centered properly, then I decided it needed to be reversible but consistent with the Mets fan theme. After some consideration, I decided to use the same embroidered baseball appliqué design I had used on the fleece scarves I made last October to create her own unique bandanna. I used my embroidery software to reduce the size of the original design by 43% and crossed my fingers it would stitch out okay. Then I added the word BELIEVE in an arch above the baseball and the name Mets in script across the front of the ball. I stitched it out on piece of blue cotton fabric and used a piece of white flannel for the appliqué. And it stitched out great, if I do say so myself. I stitched the embroidered piece to the Mets fabric, leaving room to turn it right side out, then topstitched all around the edges in orange thread. I think it turned out great. So, I had all my props and "costuming" ready, and only had to get Keli to cooperate by posing and looking like she was excited to have her photo taken by me. I admit, I've taken her to have portrait photos at PetSmart a couple of times; I've been trying to take "portrait" style photos of her myself for Christmas cards and seasonal pictures to save some money, but she usually gets bored, won't sit up straight or holds her ears back . . . I won't reveal how I got her to be more expressive in these shots, but I will say that the prospect of a new toy was a good motivator. I was pleased with the results and submitted about 6 photos. It was too hard to pick just one. A few days later, there was a Met Your Pet link added to the Mets' website to submit only one photo, which I did as well. We'll see what happens and I'll report back in a future blog entry. That's all for now -- I'll get caught up on some other sewing and embroidery topics in my next entry.